When I gave birth little Teddy, I knew I wouldn’t be in the kitchen for a while, what I didn’t realize is, that after our extremely generous friends and family members finished supplying food for us, that our diet would consist strictly of fast food, cans of soda and frozen pizza – three items we rarely have more than once a month, let alone five consecutive days in a row. After a final drive-through meal of fried chicken, biscuits and mashed potatoes, I finally declared it time to haul it to the grocery store, get back in the kitchen, and start having our diets resemble something close to a balanced diet. I’ve made dinner twice this week, easy dinners of course –this roast chicken and these slow-cooker blackberry chicken sandwiches if you want to know – and it’s felt sublime. On top of getting back in the kitchen, I’ve also made a point to actually shower, dress semi-cute, and do my hair and makeup on almost a daily basis, and let me tell you, that does wonders for helping feel like myself again. Today, I managed to get dinner in the slow-cooker, get both myself and Teddy dressed before 1pm, and go out for a nice leisurely lunch (according to his feeding schedule, of course) with my Mom for one of the first healthy meals I’ve had in weeks. I ordered a lovely lyonnaise salad with a perfectly seared piece of salmon, and my Mom ordered a plate full of spaghetti squash, that was equally delicious. While I was very happy with my choice, my Mom’s meal made me want to bump up the spaghetti squash recipe I was planning on sharing later in the month, to today. 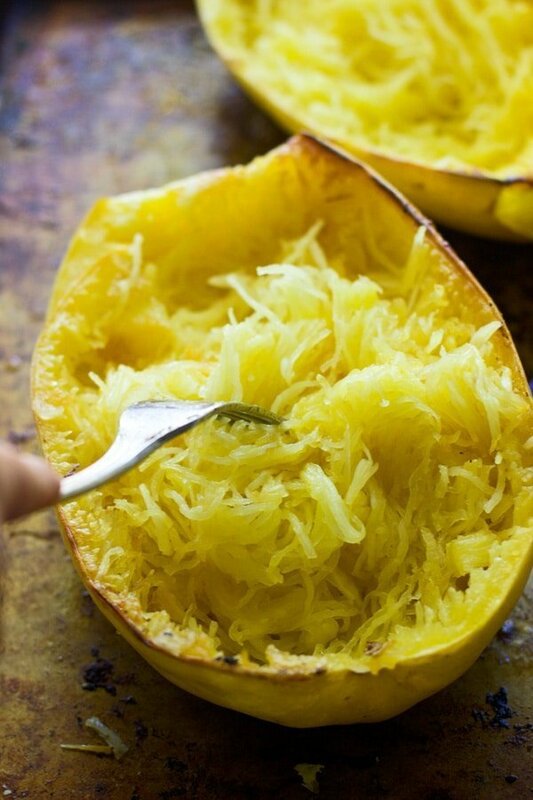 I adore spaghetti squash, not only because the texture and appearance mimics classic spaghetti beautifully, but also because it’s just plain tasty. 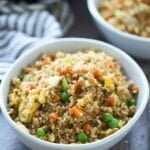 Even simply seasoned with a little bit of salt and pepper, it’s a vegetable that I can eat as an entrée in a heartbeat – something not easily done with other veggies out there. Here, I went with a sort of tex-mex version that requires only six ingredients (besides the squash), most of which can be found right within your fridge or pantry, and all which are extremely inexpensive to purchase. The squash is first roasted with a little bit of olive oil, salt and pepper, shredded into spaghetti and then tossed with plenty of chili powder, black beans, a can of roasted tomatoes, and smoky cumin. 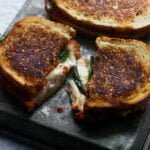 It’s topped with shredded mozzarella cheese and popped back into the oven until the cheese is melted and the inside is hot and bubbly. Drizzle olive oil over squash, sprinkle with salt and pepper. 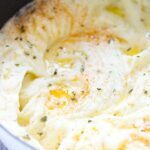 Place cut-side down on a rimmed baking sheet. Bake for 40 minutes or until you can pierce the squash easily with a fork. Use a fork to gently remove the "spaghetti" strands from the inside of the squash, try to retain the shape of the skin, you will be putting the squash back in. You should have about 2½ cups of squash. Transfer to a medium bowl. Add diced tomatoes, black beans, chili powder, cumin and salt to the squash. Toss until combined. Transfer squash mixture back to skin and sprinkle with cheese. Place back in the oven until the cheese is melted and the mixture is hot, about 15 minutes. 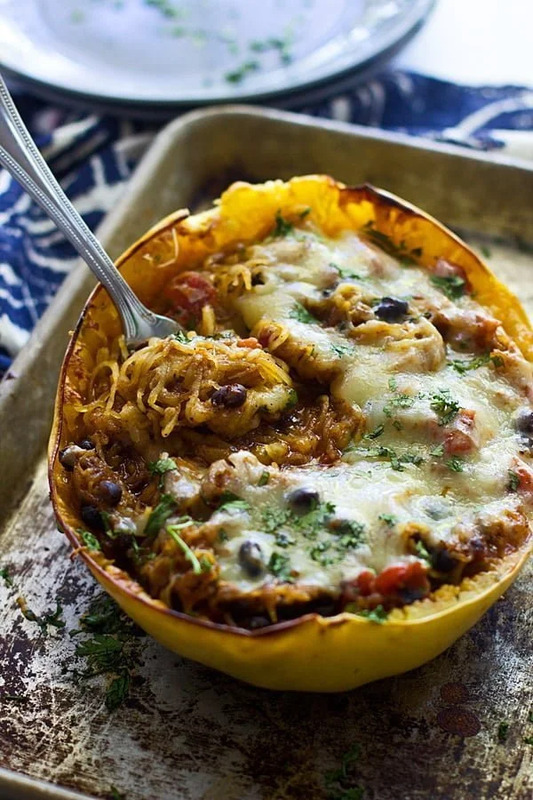 16 Responses to "Roasted Mexican Spaghetti Squash"
I’ve been on a spaghetti squash kick lately! I’ve made pad thai (coming to my blog next week), and a spinach artichoke version but I haven’t made a Mexican one! Pinning this and making next weeK! It’s just so good!! Pad Thai sounds relish!!! Thanks Lauren! 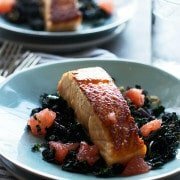 Such a hearty winter meal, this looks great especially for being so quick prep wise. Thanks for sharing! Ah yes, the ol’ showering and putting jeans on…it’s always a struggle to make an effort when you work at home and/or are a busy mom! I can’t tell ya how many days in a row I’ve worn the same yoga pants and sweatshirt, ha! So happy you’re back in the kitchen cooking up a storm, and this spaghetti squarrrsh….gaaaaah! You’re combinging two of my favoite foods here and it’s driving me nutsolla! Bravo, m’dear! Have a great weekend! I’m glad you are finding some time to do the little things that make you feel like you!! 🙂 And this squash?? Looks amazing! Oh my gosh this looks delicious! 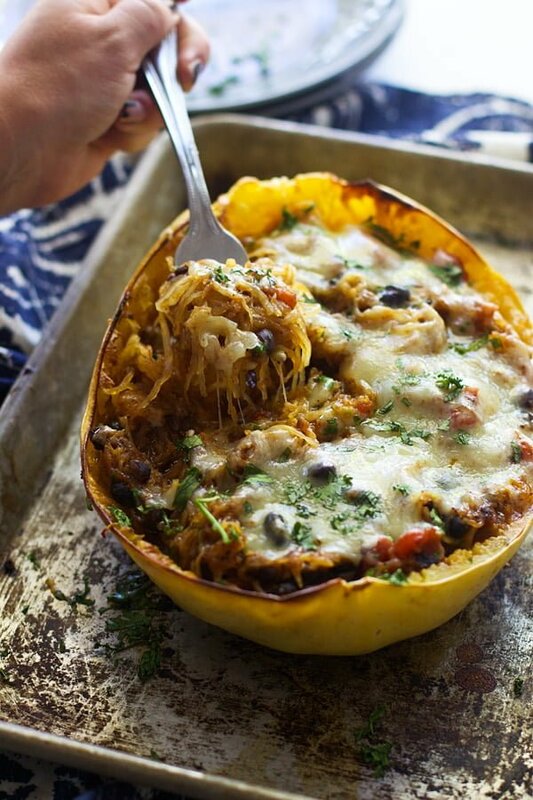 Spaghetti squash aren’t so common here in the UK, but I’m going to do my very best to search for one while it’s still winter so I can make this gorgeous dish. 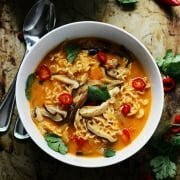 I made this tonight and added chicken too – so delicious! Thanks for a great recipe! This looks great! 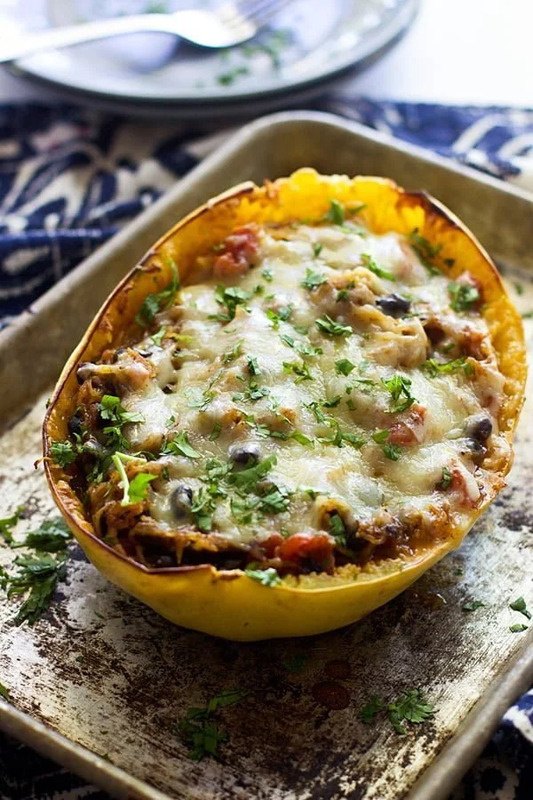 Planning to make it tonight for dinner – my first spaghetti squash meal ever! 🙂 just to confirm- the full recipe is for only 1/2 of the squash but serves 4? I have medium sized spaghetti squashes and my boyfriend is a very big eater. Do you think doubling the recipe is enough for entree sized portions? Thanks! I’m so sorry for the delay! I recently had a baby, so I took some time off! I hope this turned out for you! I don’t know why we marked that the recipe served 4 entree portions, it only serves 1 entree portion and 2 side portions, so if your boyfriend is a big eater, I would definitely double the recipe. 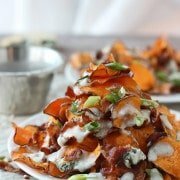 I’m updated the recipe now!